This is a Sunday roast with a modern twist, perfect for sharing family style. 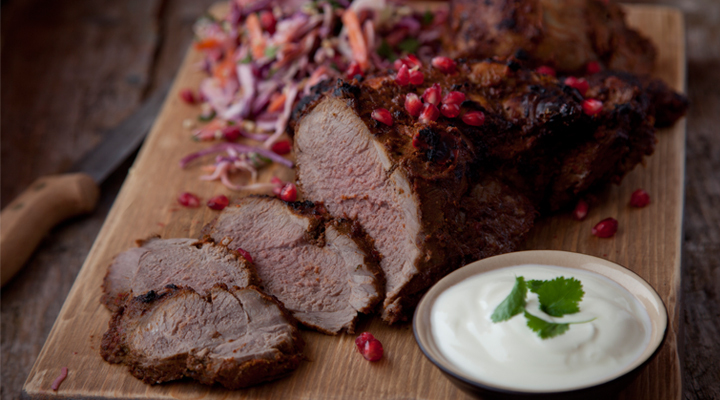 The lamb is full of robust flavours, while the raw ingredients in the slaw pack a serious nutritional punch. To make the harissa rub, put all the ingredients into a pestle and mortar and mash together to create a paste. Rub the paste all over the lamb and let it infuse into the meat for 15 minutes. Sear the lamb on the barbecue for 5 minutes on each side, fatty side down first. Turn the heat down and close the lid. Cook the lamb for 30 to 40 minutes, turning occasionally. The time will vary slightly depending on whether you’re using a gas or charcoal barbecue. Meanwhile, to make the summer slaw, whisk the yogurt, lemon juice, olive oil and mustard together with some salt and pepper. Toss the carrots, beetroot, cabbage, almonds, pomegranate seeds and mint together in a large bowl. Pour over the dressing and toss again until the slaw is evenly coated. When the lamb is done, rest it for 10 to 15 minutes before carving into slices. Serve with the summer slaw and pitta bread.